A Facebook page that claimed to be the official home of North’s Korea’s main national TV channel, Korean Central Television, has disappeared. 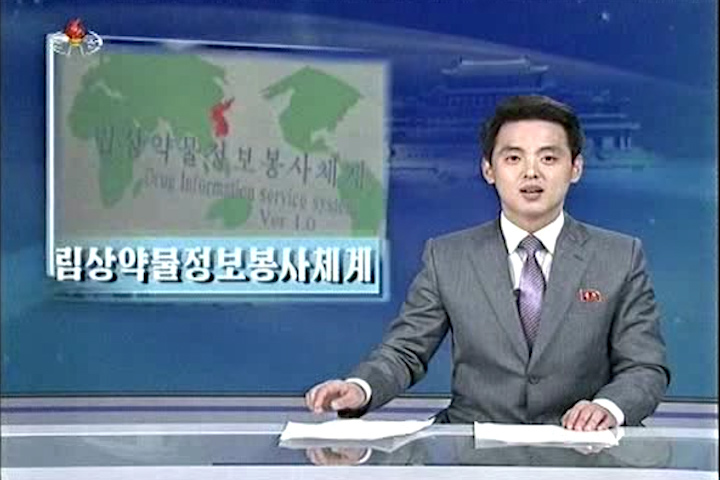 The page appeared to have been around for at least a month and content included links to KCTV news bulletins on the YouTube channel of the China-based Uriminzokkiri website, photos and stories from the government’s Korean Central News Agency (KCNA) and some “behind the scenes” pictures from the TV station. It was written as if it was being run from within the TV station in Pyongyang — something that appears to have fooled several major international news agencies — but a series of inconsistencies in the content made it much more likely to be the work of a North Korean fan in the west. Early this week, after those inconsistencies were highlighted on NorthKoreaTech and South Korea’s National Police Agency said it was looking into blocking the page, the Facebook account went silent. The account was deleted by its owner, Facebook told NorthKoreaTech. A lot of the media attention on the page focused on its livestreaming of Korean Central Television but, as noted here earlier, the two livestreams offered by the site weren’t actually original. They were simply embedded versions of two streams that remain available. The first is being carried by Ustream, a U.S.-based video streaming site, and appears to be provided from Japan by the General Association of Korean Residents in Japan (Chosen Soren). The second comes from Unification Broadcasting, a Seoul-based defector-run site that analyzes media coverage on both sides of the Korean border. 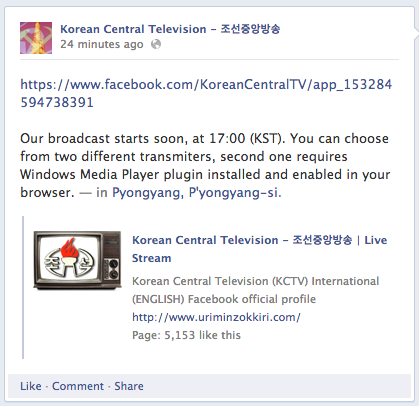 A Facebook posting claiming to be from Korean Central Television in Pyongyang advertises two livestreams of its daily program. 3 Comments on "KCTV Facebook page deleted, but streams live on"
I’m wondering how Uriminzokkiri has a Youtube account, given that it is blocked in China. That Facebook page was mayhaps the work of our YouTube friend rodrigorojo, (in)famous for posting video footage from KCTV. There is a new Facebook page and an accompanying website in the name of KCTV, but this time rodrigorojo “signed” his work. The website’s content is largely copied from the English Wikipedia article on KCTV. On a sidenote: The map on top of the website only has the “North of the country” painted in red, not the whole peninsula as KCTV would do. Ah, in case it’s not clear, click on my name above to access named website. Also here is another “stream” claiming to be KCTV. The content is notably different from that on ustream. I wasn’t watching at 1700 KST so I cannot confirm if they immitated the start-up sequence, trying to be the real thing.